Lists of politically exposed persons (PEPs) or high-profile persons (HPPs) were compiled before the bank, now known as Irish Bank Resolution Corporation, was liquidated nearly a year ago. FINANCE MINISTER MICHAEL Noonan has said that Irish Bank Resolution Corporation (IBRC), the former Anglo Irish Bank, has a “legal obligation” to hold lists of high-profile borrowers and has insisted that its existence does not indicate they have had any preferential treatment. 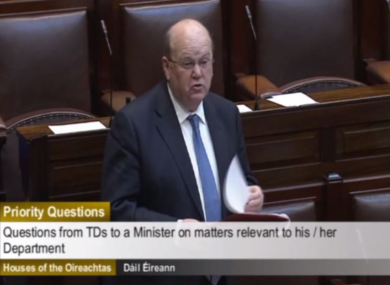 Noonan was responding to questions in the Dáil about recent reports of lists of “sensitive” borrowers from Anglo and Irish Nationwide that were complied by IBRC with indications that broadcasters, judges, sports stars and high-profile businessmen feature. The Minister told the Dáil that under the Criminal Justice Act 2010 IBRC – which was liquidated in February last year – has been required to maintain lists of “domestic high-profile customers or borrowers”. He said their “inclusion of customers on these lists were standard business practice and in no way indicates any preferential treatment for these customers” saying the lists exist for the opposite “to avoid preferential treatment” because of their status. Independent TD Thomas Pringle, who had raised the issue, said it was “vitally important” that people are reassured that those on such lists are not given “preferential treatment”. Noonan said that the lists were compiled before the bank was liquidated in a dramatic late-night sitting of the Dáil last February and said that as part of the process of winding-up the bank the special liquidator was ensuring that “nothing untoward happened”. He said the liquidator, KPMG’s Kieran Wallace, is required to refer anything they come across that may be criminal to the gardaí. “So far, he has assured me that he has not come across anything that would amount to malpractice,” Noonan told Pringle. Email “Noonan: Lists of high-profile Anglo borrowers are ‘to avoid preferential treatment’”. Feedback on “Noonan: Lists of high-profile Anglo borrowers are ‘to avoid preferential treatment’”.